Iranian President Mahmoud Ahmadinejad appears to have been arrested and held for questioning for seven hours this week by order of Supreme Leader Ali Khamenei. Ahmadinejad was quizzed about his campaign to promote his favored candidate in the much-anticipated June 14 election of the Islamic Republic’s seventh president. I have collated these two reports, one detailing news of his arrest and questioning and the other shedding light on Ahmadinejad’s campaign for his chosen successor. Iranian President Mahmoud Ahmadinejad was arrested and held for seven hours Monday and warned to keep his mouth shut about matters detrimental to the Islamic regime before he was released, according to a source within the Revolutionary Guard’s intelligence unit. After his visit to Tehran’s 26th international book fair Monday (April 29), the source said the head of Ahmadinejad’s security team informed the Iranian president that he had been asked to appear at the supreme leader’s office for an urgent matter. On the way to the meeting, contact between the security team within the president’s convoy was disconnected while three other cars joined the convoy, instructing the lead car to take a different direction. Ahmadinejad, instead of being taken to the supreme leader’s office, was taken to a secret location in one of the buildings belonging to the Foreign Ministry, which is under the control of the Revolutionary Guards’ intelligence unit. As soon as Ahmadinejad exited the car, he and his security team were involved in an altercation with Guards’ members in which his team was disarmed and communications equipment confiscated. 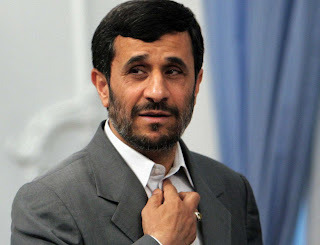 Ahmadinejad was then forced to enter an office belonging to Hossein Taeb, the head of the Guards’ intelligence, located underneath the building. As this was happening, the source said, hundreds of other Guards’ members from the intelligence unit sought out Ahmadinejad’s associates throughout Tehran and questioned them on the existence of documents detrimental to the regime. Ahmadinejad was questioned for hours in a meeting with Taeb; Asghar Hejazi, the head of intelligence at the supreme leader’s office; Mojtaba Khamenei, the supreme leader’s son; and Gholam Hossein Mohseni Ejei, the attorney general. He was warned to back down from his claims against regime officials and given an ultimatum. The source added that Ahmadinejad was released back to his security team at 11:45 p.m. Monday, Tehran time. Earlier, the regime’s media outlet Baztab reported that with just days remaining for the registration of presidential candidates, Ahmadinejad warned associates that if his hand-picked candidate to succeed him, a close confidant and a top adviser, Esfandiar Rahim Mashaei, was rejected as a candidate, then he would reveal tapes that will show the regime defrauded the voters in the 2009 presidential election. One tape reportedly quotes officials as telling Ahmadinejad in 2009 that they will announce his total winning tally as 24 million votes where the real number was 16 million. In the same tape, Ahmadinejad insisted that the officials not do that. The Baztab site was immediately taken down by the regime’s security forces and is still offline. Millions of Iranians took to the streets after the 2009 election results were reported, calling Ahmadinejad’s 62 percent tally of voters a fraud and demanding a free election. Thousands were arrested, with many tortured and executed. Ahmadinejad’s opponents, Mir Hossein Mousavi and Mehdi Karroubi, have been under house arrest ever since. Under the constitution of the Islamic Republic, the 12-member Guardian Council decides the eligibility of who can run for office in the country, and anyone with any history of opposing the regime is barred from participation. The council is made up of six Islamic faqihs (experts in Islamic law) appointed by the supreme leader and six jurists nominated by the head of the Judiciary (who is himself appointed by the supreme leader), and then approved by parliament. Ahmadinejad had previously warned that he would release documents not only on high-ranking Guards officers but also on leading members of parliament and the Justice Department that prove financial fraud. The source added that it will be interesting to see if Ahmadinejad takes the warning or if he creates more problems with the regime, but one thing is sure: He could end up dead if he doesn’t. The public relations office of the Iranian president subsequently issued a press release rejecting the existence of such a tape that points to fraud in the 2009 elections. In its release, it stated that publishing such news, by the regime’s media Baztab, is only with the intention of creating instability before the upcoming elections. “It is potentially of considerable significance given the on-going internal political struggles as the election approaches,” one diplomatic source said. As the countdown begins for elections that will usher in Iran's first new president in eight years, all eyes are still on Mahmoud Ahmadinejad, the unpredictable and mercurial man who looks unlikely to go quietly. Shortly after the 14 June poll, he will have to relinquish his office in Tehran's Pastor street and hand over the keys to his successor. Given the tight timetable for Iranian elections, it is almost impossible to guess who that person will be. With just six weeks to go, registrations for presidential candidates are only due next week. A number of hopefuls have already announced plans to run but their candidacies will not be valid until the powerful Guardian Council vets their competence and loyalty to the Islamic republic. In 2009, out of 476 registered nominees, only four candidates were allowed to stand – two of them, Mir Hossein Mousavi and Mehdi Karroubi, are under house arrest for refusing to accept the results and for alleging fraud. The final list of this year's candidates is expected on 23 May and a three-week campaign period will follow. Despite this, Ahmadinejad has embarked on an extensive schedule of provincial visits in what is suspected to be part of an election strategy designed to promote his favoured candidate. On Wednesday, he was visiting Rasht, the capital of northwestern Gilan province, situated on the coast of the Caspian Sea. At the weekend, he went to Tabriz in the East Azerbaijan province. Previously, he visited a number of other provinces, such as Isfahan, Khuzestan and Semnan. He is not alone; other nominees are following his footsteps. Under Iranian law, the president cannot run for a third term but all the signs indicate that the 57-year-old Ahmadinejad, a relatively young politician in the Iranian hierarchy, has no plans for retirement. On the contrary, he is accused of planning a Putin/Medvedev-style reshuffle by grooming his chief of staff and close confidant, Esfandiar Rahim Mashaei. In the eyes of loyalists to the supreme leader, Ayatollah Ali Khamenei, today's Ahmadinejad bears no resemblance to the young revolutionary and later Tehran mayor who rose to become president in 2005. Back then, he quickly became the ayatollah's protégé, enjoying an unprecedented influence over Iranian politics. Now, Ahmadinejad is at odds with his erstwhile patrons in the Revolutionary Guards and widely seen as a lame duck. Ahmadinejad has fallen foul of the loyalists because of his unwavering support for Mashaei, who is accused of leading a deviant current in the inner circle of the president, loathed for their advocacy of greater cultural openness and nationalism. Many are already counting down Ahmadinejad's dying days in office, believing they are his final days in power. Others think he still has a chance and, in case Mashaei is disqualified from running, is issuing challenges to the establishment by threatening to go out all guns blazing and pulling down the edifice of the political system that championed him. But who is afraid of Ahmadinejad? In February, the president played a secretly filmed tape in the Iranian parliament - to the astonishment of millions of Iranians listening on national radio - that revealed the speaker's brother was allegedly trading on his sibling's influence for financial gain. Many fear that the president's team have many more secret tapes and videos that could pose serious challenges to the Islamic republic; others say that is a bluff. "They have installed hidden cameras, listening devices in order to collect information and release them in public," Mohammed Ali Montazeri, a judicial official, warned this week. Baztab, a conservative news website critical of the government, said in a report that Ahmadinejad was rumored to possess a tape that shows he received a phone call from the authorities right after the 2009 elections telling him they planned to announce that he had won millions more votes than the real tally. This was denied by the president's office this week and Baztab was taken offline on Wednesday. "There are things to say..." Ahmadinejad said on a recent visit to the holy city of Qom, promising to reveal them at a future date. The president's menacing language has infuriated his rivals and, as elections approach, everyone is watching for any unexpected movements that may embarrass the supreme leader. Who are you with, Israel or Assad?